The second of the Netflix films that I wanted to get to was Message from the King, starring Chadwick Boseman. I’m not sure what I was expecting from this one, but what I got was a film that started as a type of a mystery, but evolved quickly into a dark tale of revenge. Jacob King (Chadwick Boseman) arrived in Los Angeles from South Africa in search of his sister Bianca (Sibongile Mlambo), who had disappeared inside the city’s sleazy sections. Jacob’s investigation quickly led him to discover that his sister had become deeply involved in the corrupt life of LA. Jacob starts off as a seemingly innocent character. Someone who has arrived in LA with eyes wide open, just hoping to find the loving sister that he remembered as a youth in South Africa. However, we discover that Jacob is anything but the innocent naive man we thought he was. In fact, he becomes as brutal as the world around him. The film plays with the questions about Jacob and why he was as capable as he was right up until the final scene of the movie. This film was all over the place for much of it. It made you think it was going to be one way, but then pivoted away into another. The inconsistencies messed with a plot that was fairly straightforward and typical. What elevated this material was Chadwick Boseman. The star of the upcoming Black Panther film showed that he was ready to lead a huge action flick with his efforts here. Boseman carried the emotional weight of the story, and the impact of everything that happened is evident on his face. The coldness is just a cover for a man struggling to do what he needed to do. Boseman is one of the best young actors around today. There is a solid cast around him as well. Luke Evans is here, though his character is fairly one note and his inclusion is confusing. Even though this, Evans was someone who you loved to hate. We also had Alfred Molina, who takes a real chance with his performance in Message from the King. There were some brutal moments in the movie, as it earned its R rating, but I don’t think the film ever really took it too far. The action was solid, although pretty basic. The performances were the strength of this film, while most of the rest of it was unremarkable. This one is a borderline film for me. 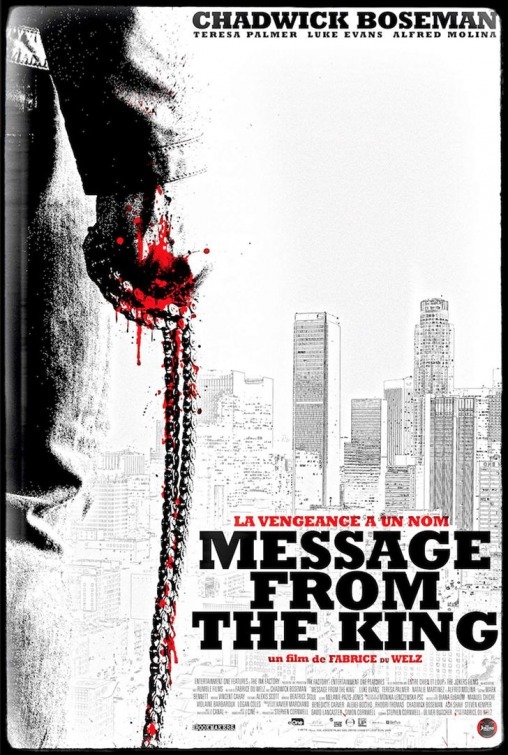 If you like a straightforward revenge action flick, you could do worse than Message from the King.